The old fashioned way of drying clothes was to hang them on the clothesline and this is still very common in Conche, Newfoundland. The fresh air that blows through your clothes on a clothesline gives your laundry a much fresher smell and cuts down a considerable amount on your electric bill. 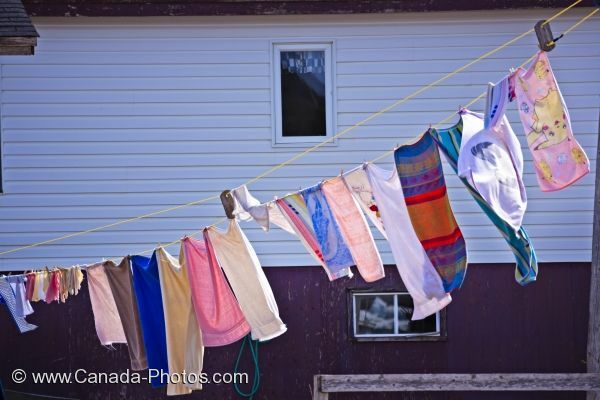 You will find many residents in this small town of Conche, Newfoundland that still love to hang out their laundry on the clothesline. Clothes drying the good old fashioned way - on a clothes line in Conche Harbour, Conche, French Shore, Northern Peninsula, Great Northern Peninsula, Viking Trail, Newfoundland, Canada. Picture of clothes hanging to dry on a clothesline in the town of Conche on the Northern Peninsula of Newfoundland, Canada.